On July 29th, 2018, I received a phone call from the storage facility I keep some of my belongings at, informing me of an urgent matter. 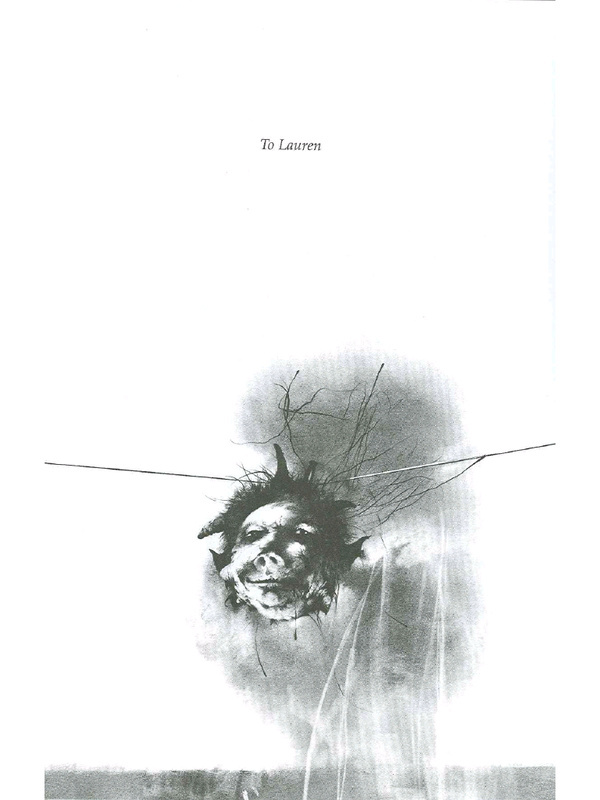 These ominous words made my blood run cold, and I knew something was terribly wrong. 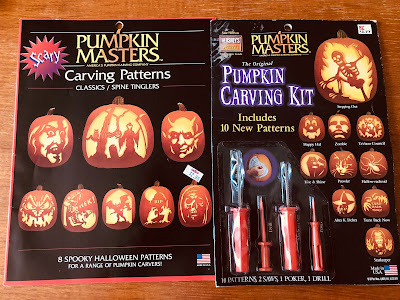 My first thought was towards my Halloween items, especially my pumpkin carving kits (which I have written at length about here, here and here). Had a water main burst and ruined them all? I had just heard several sirens pass by…had the facility caught fire? I couldn’t bear the thought. No, I was informed, there was no elemental disaster in my unit. But someone had forced open my storage locker, and it looked like some things were likely stolen. My immediate presence was required. I felt the Sunday languor that had previously confined me to the couch decaying and falling away, replaced by a newly awoken sense of dread. Still, I reasoned, how bad could it be? I had an Xbox 360 that would have been visible to anyone entering the unit along with a stack of games, so that was probably gone, but who takes pumpkin carving kits? I mean, they’re worth money, especially the older and rarer ones, but most people are unaware of that and they’re not exactly the most liquid assets. Most of my stuff was probably fine, and I was at least grateful that the majority of my Magic cards weren’t in there at the time. As it happens, the Xbox 360 was indeed gone, along with about half the items that had been in the unit. 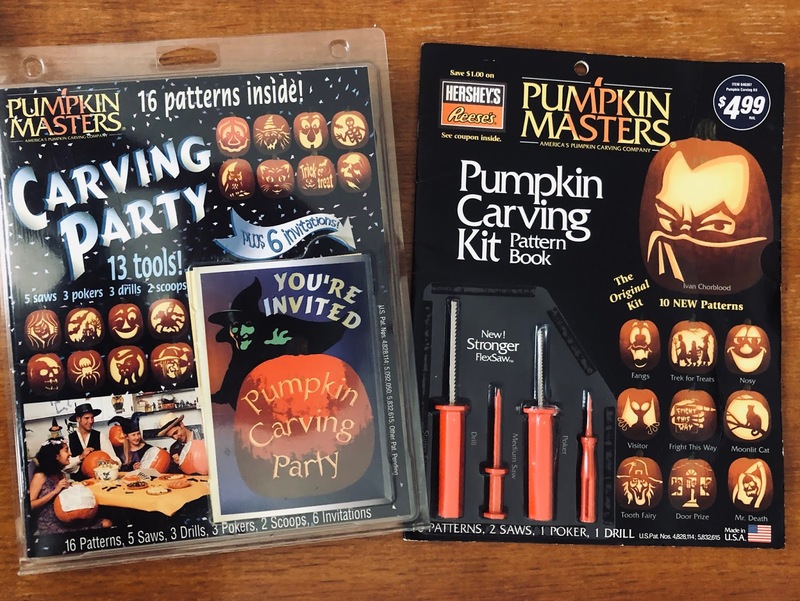 Much to my dismay, this missing half included every last one of my pumpkin carving kits. As pathetic as this sounds, this was honestly heartbreaking for me. I have been collecting these things for about twenty years at this point, and some of the older ones were hard to come by even back then. 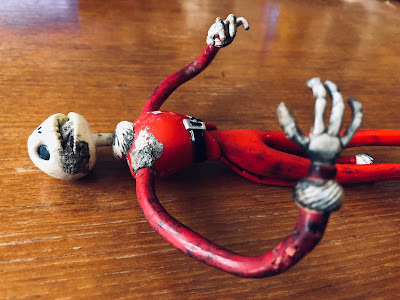 Due to the ephemeral nature of these things (they are, after all, crafts kits for creating extremely temporary artwork), most of these are destined to be purchased, used up and discarded. 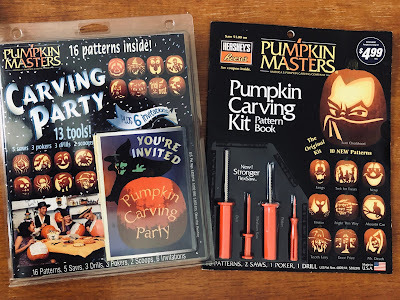 How many intact pumpkin carving kits from the 80s/90s still even exist? For many of the ones I owned, the first time I saw them was also the only time: on the day I purchased them. But all the heartbreak in the world couldn't change the inescapable fact that my collection was gone, and after a couple days of processing this, I decided to rebuild. Here are a few shots of some of what I've picked up in the months since the incident occurred. To be honest, I'm quite surprised at what I've managed to find. Sometimes refreshing eBay for hours on end really pays off. 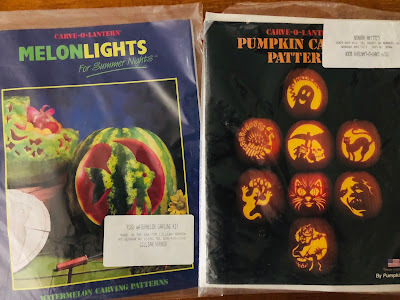 The saddest part of it all is that my old collection probably got chucked into a dumpster once the thieves realized what it was, since books of pumpkin carving patterns aren't the easiest thing to fence, regardless of their scarcity and value to the right people. Either that, or someone out there is creating treasured Halloween memories with their ill-gotten gains. Of course, it would be wrong of me to wish, were this scenario to occur, that the thieves' freshly carved jack-o'-lanterns mysteriously take on a life of their own, rise up in ghastly concert and exact bloody vengeance in a Tales from the Crypt-esque scenario. But like, wouldn't it be weird if that happened? 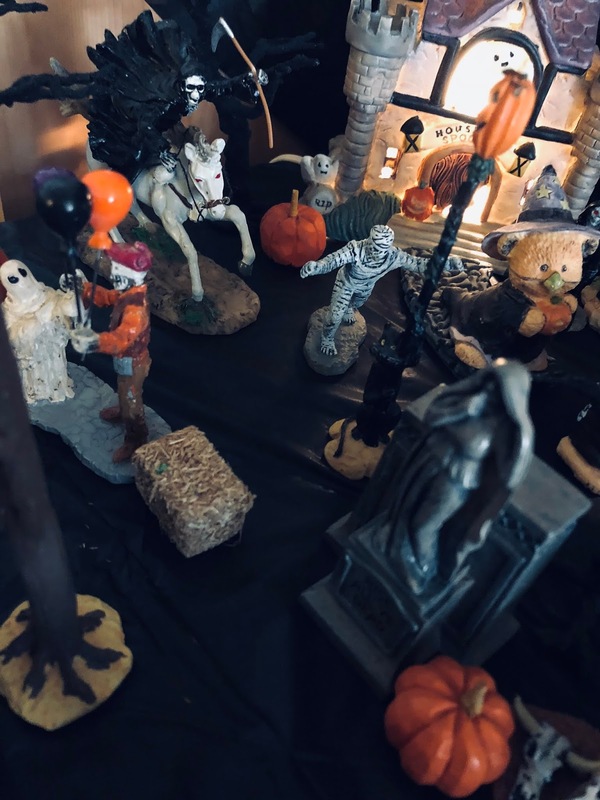 In happier news, the rest of my Halloween decor remained mostly intact. There were a few losses here and there, but the majority of my Halloween village survived. This is a huge relief, if for no other reason than how do you even find "resin figurine of a cat clutching a lamppost from the 1992 Oriental Trading Co. catalog" on eBay? As I set the spooky town up a few days ago, I scaled it back a bit from my previous setup; despite picking up a some new additions to the macabre menagerie, a more intimate, less sprawling approach felt appropriate this year. I think it came together pretty well, and stands as a symbol of endurance in the face of tragedy. I probably should have draped an American flag behind it or something. It's been a weird few months, and I was worried that my enthusiasm for Halloween this year would be dampened due to the summer robbery. Instead, I'm doubling down and making it my most productive Halloween season yet. 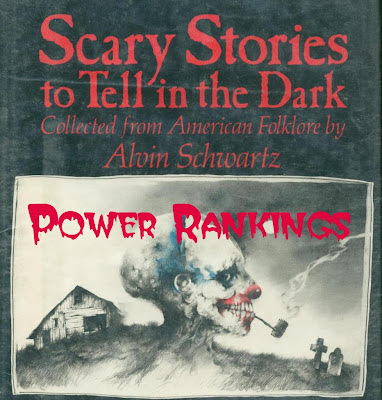 Rebuilding is tough, and even a little scary...but isn't scary what Halloween is all about? I mean, at least I had insurance. But trust me on this: trying to explain the current market value of a super-rare Cat Lover's Pumpkin Carving Kit to an insurance company might be the most terrifying thing of all. Joey Marsilio thanks you for listening to his venting about theft, and hopes you enjoyed the abundance of photos here as reparations for the unpleasantness. 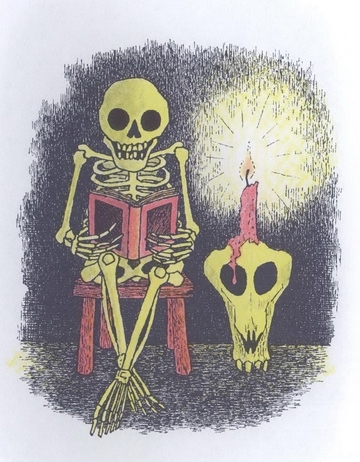 And if you're in the mood to read a book he wrote that happens to take place during the Halloween season, he also wrote the novel Henry Garrison, which you can preview here.